The use of 3D printing in the medical field seems all the rage of late as every week a new story breaks about a new invention that will revolutionize … something. Just last week we featured a story about a 3D biopen that can be used in surgeries. A new startup called Seraph Robotics, a spinoff from Cornell University’s research wing, is working on a new leap in 3D printing that could bring the ability to print replacement body parts. The company is currently adapting a line of printers using a syringe-like cartridge for 3D printing that it has licensed from a lab at Cornell. While their long term vision includes the printing of replacement body parts, for now, they are working on a smaller, more targeted scale. Looking at some of Seraph’s work, Lou Walcer, the director for the McGovern Family Center for Venture Development in the Life Sciences where the company is based, said “when we first encountered Seraph Robotics, they were proposing to do a lot of different things, including food printing, with their platform technology.” Since then, the team has turned its attention towards bio printing and have had several promising tests, including successfully printing anatomical simulators for surgical training. 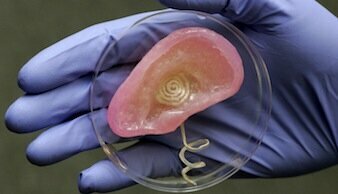 For the moment, the company is selling 3D bio printers to academic research labs for $5,000 a pop. These printers can be customized to those labs’ needs with custom add-ons and modifications. It will be some time before they can really roll out printed replacement body parts, but those familiar with the company have faith the team will eventually reach their goal.